To use a Rubric with your assignment, first setup the assignment. 1. Turn editing on for your course and select Edit next to the assignment a rubric will be used. 2. 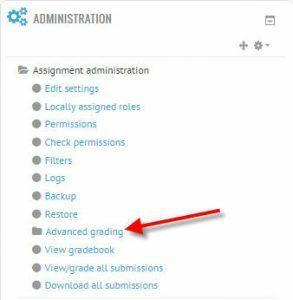 Choose Edit Settings and scroll down to and expand the Grade dropdown arrow. 3. Under Grading Method, select Rubric, then click Save and Display. 4. Next, we have to actually setup the Rubric. On the left, under Assignment administration, click Advanced grading. 6. Give the Rubric a Name, and a description (if you want). 7. Now, we will begin adding Criterion to our Rubric. Click in the boxes provided to edit and add criterion, levels, and assign points. 8. Below the actual Rubric, you have multiple options. You can determine to allow or deny students to view the rubric itself, the description, points, or remarks. 9. When you are finished, you can Save rubric and make it ready, or save it as a draft to work more on it later. 10. By clicking Save rubric and make it ready, you are given the option to publish the form as a new template. *This would allow you to use this rubric for other assignments in this course. 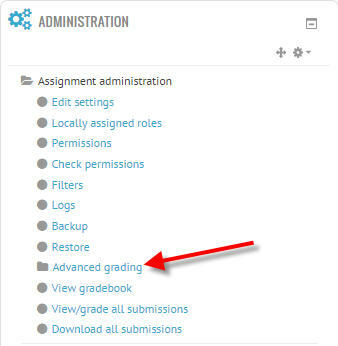 To retrieve a saved Rubric Template for future assignments, you would select Create new grading form from a template in Step 5.